Our production SharePoint Farm and customer users are deployed in one domain, let’s call it Root, while the development and quality control farms are in a child domain, let’s name it Child.Root. The Child.Root domain trust to the parent Root domain, while the Root domain knows nothing about the Child.Root. So, we have a one way trust domains configuration where the Child.Root trusts Root, but not vice versa. Under such conditions we have faced the issue with SharePoint Search when an user from the trusted parent Root domain gets zero results, executing a search query on the Child.Root. The solution was borrowed from the Microsoft Knowledge Base Article – Unable to Perform a query on a One-Way trust Domains Scenario when an User from the trusted domain performs the query and the SSA Application Pool account is from the Trustee Domain. The topology described in the KB article presumes that domains with a one way trust relationship are in two separate forests. Despite the fact that in our case both domains are in one forest, the solution works great, though. After the SetProperty() command has set value of the ForceClaimACLs parameter in the search administration database to 1, ACLs are stored as Claims instead of NT tokens. Note, however, that you needn’t switch other SharePoint applications (different from the Search Service Application) to Claims based authentication. Also, keep in mind that this is a one-way change, so you won’t be able to reverse it back to classic mode. 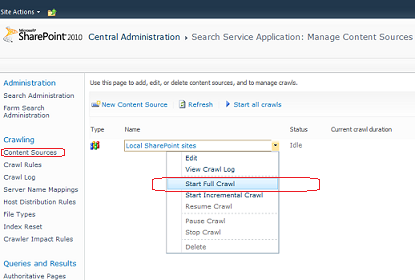 After the full crawl is performed, users see search results, regardless from which domain they are logged in. SharePoint: Workflow + List Item Edit Form = Value cannot be null Exception SharePoint: Cannot open log for source. You may not have write access.